Title page of Copernicus, De Revolutionibus, the last two words in the title, 'celestium orbium' were added without the knowledge of the author or editor, Rheticus. 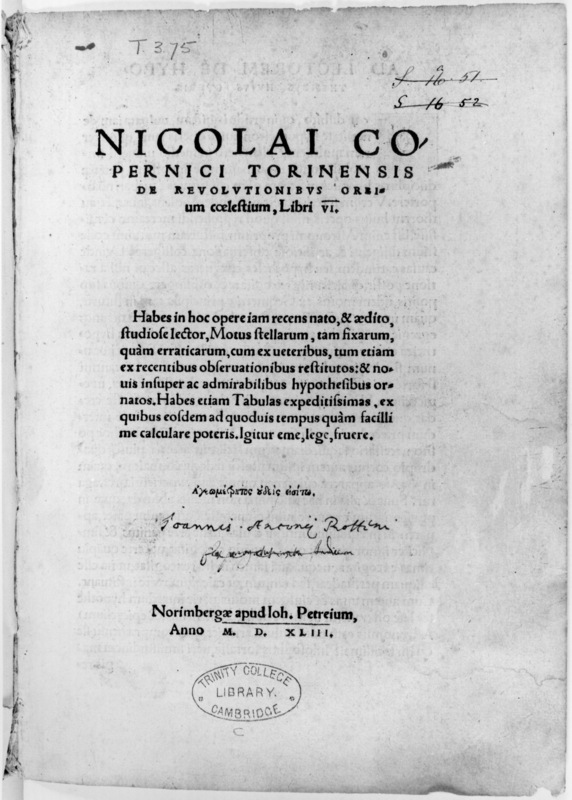 Following the favourable reception of the Narratio Prima,the Nuremberg printer Johannes Petreius asked Georg Joachim Rheticus to secure the printing of Copernicus' next work. Bearing books from the Petreius press as gifts, Rheticus made a trip to Frombork, which was successful. In 1542, Rheticus began supervising the publication of the De Revolutionibus in Nuremberg with Petreius, though he left before its completion to take up a post at the University of Leipzig. When it was finally published in March 1543, the De Revolutionibus contained an anonymous letter to the reader and two additional words to the title, celestium orbium ('of the celestial orbs'), which neither the author or Rheticus had intended. Copernicus dedicated the book to Paul III (Pope: 1534-49) who was known for his astrological predilection: he had promoted an astrologer (Luca Gaurico) to a cardinal because he had twice forecasted his election to the Papacy. In the preface, Copernicus humbly presents himself as seeking astronomical reform by appealing to classical precedents and the aesthetics of symmetry and decorum, popular in the ecclesiastic court of the Pope. The book was written in six parts. Copernicus accepted the observational data of the Greeks and aimed to restore uniform circular motion to the planetary theory of Ptolemy's Almagest. In structure and in inspiration, the De Revolutionibus was a very similar to Ptolemy's work. At the final stage of the printing, an anonymous preface had been appended without the permission of the author or Rheticus to the De Revolutionibus, excusing Copernicus' heliostatic claims as a mere hypothesis. Its author was Andreas Osiander (1498-1552), a Lutheran pastor at Nuremberg, a fact that Kepler was later to publicize. Scholars are agreed that Copernicus believed that his mathematical model of the universe was physically true. In terms of the disciplinary distinctions maintained in universities at the time, however, this did not make sense. Astronomy then was taken as a mathematical discipline which at best was a model which agreed with the phenomena. Reality about the physical world, on the other hand, was established through causal investigation in natural philosophy, not mathematics. Thus, Osiander's response to Copernicus was fairly typical of university-educated men at the time. Many believed that Copernicus had not proved that heliocentrism was physically true, but that he had provided a more accurate mathematical model. 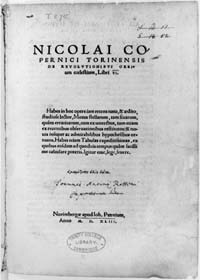 This partial acceptance of Copernicus' work was disseminated widely through Philip Melanchthon (1497-1560) and his students at University of Wittenberg (thus often called the 'Wittenberg Interpretation'). Melanchthon, the Lutheran educational Reformer, incorporated into his textbook, Introduction to Physical Doctrine (Initia Doctrinae Physicae), Copernican values for the apogees of the sun and superior planets, but rejected his heliocentric claims. Many contemporaries expected and saw the De Revolutionibus to be offering more accurate prediction of planetary positions through its tables, and thus better astrological predictions. Around 400 to 500 copies were printed for both the first (Nuremberg 1543) and second editions (Basle 1566). To date, 250 copies of the first edition and 290 copies of the second have been located. Copies once owned and annotated by Johannes Kepler, among others, are known to have survived. Extant copies with identical annotations have revealed the existence and teaching activities of itinerant mathematical tutors such as Jofrancus Offusius and Paulus Wittich. The De Revolutionibus was placed on the Index of Prohibited Books in 1616 as a result of the Galileo affair, but because of its contribution to the Calendrical Reform, it was not proscribed, but was to be expurgated. The corrections were spelt out in 1620. It seems that 60 % of the copies in Italy (and hardly any in Spain or Portugal) were censored. It was taken off the Index in 1758.